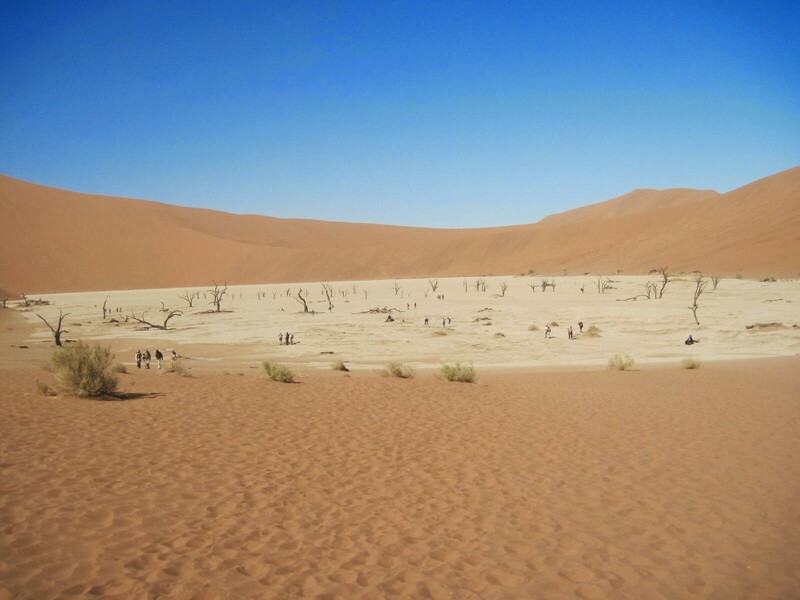 One of the biggest reasons we wanted to include Nambia on our self-drive safari itinerary was to visit the surreal landscape of the dunes of Sossusvlei in the Namib Desert. We were able to spend two days exploring the area. Unfortunately, a lot of our visit was dominated by the wind, which we described here. This pan with dead trees surrounded by massive red dunes was what we had seen pictures of and were looking forward to the most. It was a bit of a chore to get there – an hour drive on a paved road, 5 km on a sandy 4×4 track (Botswana experience came in handy here! ), and then a 1 km hike through some blowing sand. But once we crested a dune and saw the vlei, we were pretty happy to be here! Down in the vlei, the wind was mostly blocked by the dunes, so we spent a long time soaking in the surreal scenery around us. The campground for the area is located near the Sesriem Canyon, which is a pretty cool attraction in its own right. We spent an afternoon walking upstream and downstream through the dry canyon bed. This was marked on the map, but not with a sign! We wouldn’t have found it if we hadn’t seen someone else here. We were able to walk out and get a nice view of the red dunes. 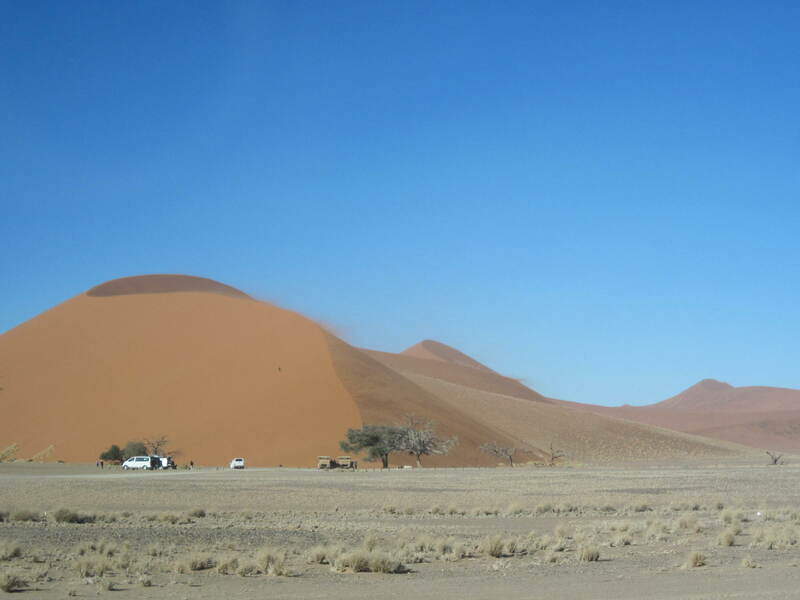 One of the most popular activities in the park is to wake up very early and drive to this dune, hiking up in time to catch the sunrise over the red dunes. We planned to do this the morning after our first night in the park. But, when the aforementioned wind was still blowing when the alarm rang, we opted not to go. We thought about doing the climb the next morning before we left, but since the wind was also blowing hard that morning, we decided to skip this dune. We were pretty bummed about this! 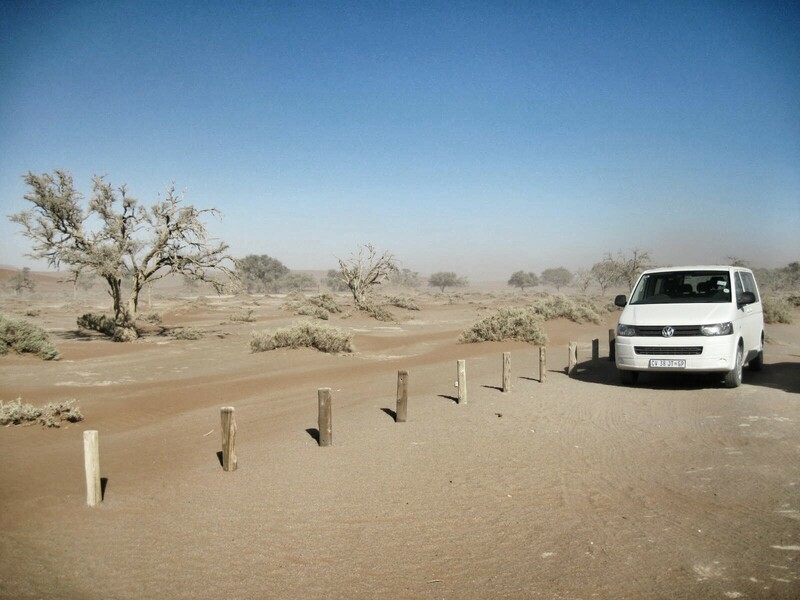 The guidebook and a sign said this was only 2 km from the main Sossusvlei parking lot. But it was so windy that we couldn’t find the markers we were supposed to follow! We definitely reminisced about that trip as well! !